Treadmills or exercise machines are very useful to many people in maintaining health and body shape. It can also be considered a reasonable way of getting fit and healthy. In this relation, ProForm PFTL 13116 Pro 2000 Treadmill can be a good way of being in that state of good health and body. You may check out all things about this treadmill through this review or even other reviews available online. Having an actual personal experience using this machine, it also beneficial. Are you a person who likes a foldable treadmill? Is so, then this might be a good selection for you. This unit has a hydraulic raise bar that when you push using your foot, one part of the machine will automatically vertically folds up. Isn’t that very convenient and easy? A person who likes watching television while walking or running will appreciate this model of a treadmill since the tablet holder incorporated to the machine can hold your gadget while you watch and workout at the same time. If you want a solid, stable, and durable treadmill, this unit may deliver just that. However, expect it to be weighty since it is really strong and well-built, intended for intense use. ProForm PFTL 13116 Pro 2000 Treadmill is manufactured by Icon Fitness, a company known for producing quality exercise machines and gadgets. You will get an exercise machine that is powered by a 3.5 CHP motor with a zero to fifteen percent incline and a zero to three percent quick decline. 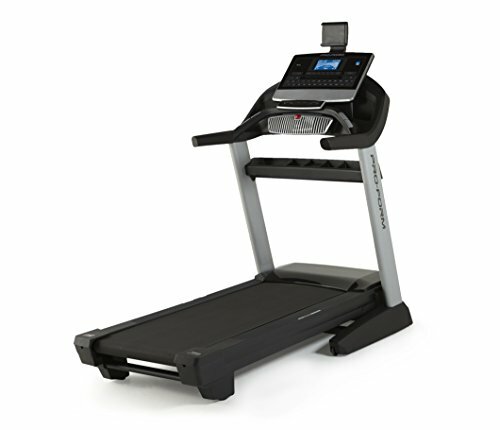 Automatic quick speed from zero to twelve MPH and a 7inch backlit LCD with race track display is included in this treadmill. You will have treadmill that can accommodate a user with weight up to 300 pounds. The construction is of solid steel with 2.5 inch on the rear, 2.9 inch at the front. The deck is 22in by 60in and cushioning by ProShox. There are a number of owners and users that consider the size of this treadmill as offensively huge and not a space saver at all in comparison with other models. But, they liked it just the same. Moreover, when folded up, this model is about twelve feet high so if you have a low ceiling, this may not be an excellent choice. Check out other treadmills instead that have shorter body when folded up. Although easy to follow, the instructions on the assembly is not that detailed. It needs two persons to do the assembly and not all the tools for assembly are included in the packaging. There are selected few who find this product not worth the money they paid for it or are a total waste due to some issues with the belt, body and assembly. There are also some issues on registering the treadmill for warranty purposes. This treadmill upon assembly is ready to use out from the box. Assembly will only take about an hour and a half and you are ready on your journey of getting fit. It is very sturdy and not noisy when you increase or decrease the speed or change the incline. The manufacturer has been in the production for over 30 years manufacturing products with the finest fitness technology and engineering. Very convenient to use and you may lose 20 to 30 pounds in a month when used daily. Just like any product, this treadmill has its pros and cons depending on the concrete experience of the owner or user. For that reason, it is best that you try out the treadmill first a couple of times before purchaising. If you find this review is not enough, you can always check out other reviews to truly help you in your decision. It is always best to be sure than regret the decision you made. Generally, this treadmill is a good product and it may deliver your expectations. Small issues can be solved with the seller or manufacturer. Amazon.com is one of the best places to buy this treadmill. You can also check out the manufacturer and other authorized dealers.